Do you have a question? Look for the answer in this list, or contact us by email or phone. How much will my fence cost? Will a fence keep my pet in the yard? Should I stain my rough-cut cedar fence? Should I build a fence before landscaping my yard? What type of fence will look best with my yard? How long has AOF been in business? What happens if you hit bedrock? What type of fencing is best? BACK UP How much will my fence cost? Short answer: we’re not sure yet. Every landscape is unique, and the amount of labour required and type of fence chosen means that we can only provide a price after we’ve gathered some details. We are proud to report our final invoices are consistently within 95% of our quote. Low-cost options are available. Contact us for details. BACK UP Will a fence keep my pet in the yard? BACK UP Should I stain my rough-cut cedar fence? All cedar should be stained to prolong life and help stop expanding and contracting of the pickets. A solid based stain can be applied after cedar has slightly discoloured to restore a great finish again. BACK UP Should I build a fence before landscaping? BACK UP What type of fence will look best in my yard? It’s not always about looks – the style may be determined by the purpose of the fence. Different types of fences will match different terrains better than others (for example, chain link or custom-built cedar fence works better with slopes than panel fencing). Contact us for a consultation to determine the best fence for your landscape. BACK UP How long has AOF been in business? 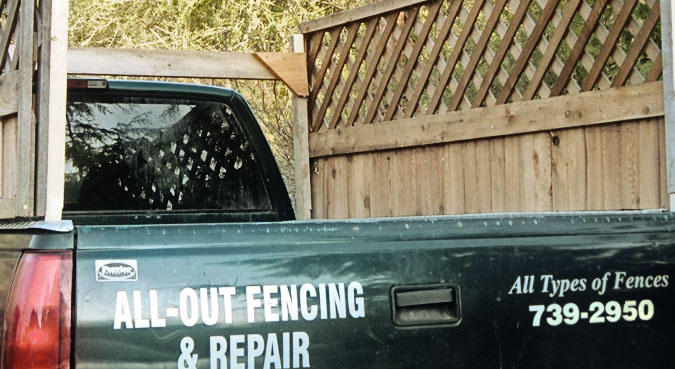 All-Out Fencing is a family-owned and operated company that has been servicing Vancouver Island since 2006 (read the about page for details). BACK UP Are you insured? Yes – All-Out fencing is fully insured. BACK UP What happens if you hit bedrock? Vancouver Island is full of rock and from time to time people have bedrock hidden just below the surface of the ground. Thankfully – and mainly due to the overwhelming presence of bedrock in our area – we have a lot of experience dealing with installing fencing on bedrock and will use a variety of techniques to get the job done. BACK UP What type of fencing is best? This is a tricky question, and we usually like to ask “What type of fencing is most suitable?”. This can be determined by terrain, budgets, and even personal tastes – and most likely a combination of all three! BACK UP How long will my fence last? As a general guideline, expect a chain link fence to only deteriorate from damages or land erosion. A cedar or pressure-treated fence post, on the other hand, will last approximately 20 years. However, if the soil is very acidic and/or has poor drainage the post may fail prematurely. BACK UP Do you warranty your work? Once you’ve hired us and we’ve completed your project, we always do a final inspection together to ensure all parties are happy with the work performed. The product is inspected upon completion, and at that point the post and concrete installation work will be warranted for 12 months. We do not warranty any damage due to vandalism such as people/animals or cars. Any other questions or comments that we may have missed? Please get in touch.